The biggest warranty providers also seem to be the most stable. Those that saw the greatest annual changes in warranty claims, accruals or reserves tended to be a bit smaller, whether the changes were up or down. At the Warranty Chain Management Conference this week, it was revealed that the total amount of warranty accruals reported by all U.S.-based warranty providers grew by 6.5% to $22.8 billion, while the amount of claims paid fell by 7.5% to $23.6 billion. While your editor adjusts to the time difference and the change in climate seen on that week-long trip to San Diego, this week's slightly delayed newsletter takes a closer look at the top 100 warranty providers, particularly those who saw their key warranty metrics rise or fall by the greatest proportion during the past year. On balance, 2010 was the year that things began to return to normal. Of the top 100 U.S.-based warranty providers, 78 saw sales growth. Of those same 100 companies, 72 saw a reduction in the percentage of sales they pay out in warranty claims. A year or two ago, it was quite the opposite story, with many manufacturers finding that they had less money coming in and more money going out than perhaps they expected. This annual exercise in superlatives (the last round was detailed in the April 1, 2010 newsletter) looks for the biggest changes in warranty claims, accruals, and reserve levels. The reason for doing this is based on a simple truth: While we can't compare companies directly, because of all the different ways they might count warranty costs, we certainly can compare a company to itself over time. And then we can compare and rank the changes. So that's what we shall do. We'll take the biggest warranty providers and look for the biggest annual changes for those three key warranty metrics. And if there's an announced reason for the change, we'll mention it. But at all of these companies, there is no mention in their annual reports that they are among the most volatile warranty providers in the country. In this newsletter, we are comparing the top 100 warranty providers of 2010 to the same 100 warranty providers in 2009. And we are charting the top 10 increases and the top 10 decreases for 1) warranty claims rates, 2) warranty accrual rates, and 3) warranty reserve balances. So there will be six charts in total, for the top 10 improvements and top 10 deteriorations in each of those three metrics. Any company on any of the six charts below are ahead of at least 90 of the top 100 in that particular metric. And the company at the top of each chart turned in the biggest percentage change of all their peers. One would assume that claims and accrual rate reductions are more positive than rate increases, just as sales increases are more positive than decreases. However, the "goodness" of warranty reserve balance changes is harder to pin down. Reductions are "good" in that they free up capital for other purposes. But increases can also be "good" in that they raise the amount of cash available to pay claims. Actually, overall, among the top 100 warranty providers, things are really headed in the right direction, if one equates lower claims and accrual rates with success. There were 72 claims rate reductions and 67 accrual rate reductions. And 53 companies saw both rates fall. So that means well over half of the largest warranty providers are headed in the right direction with their warranty process. Of those top 100 warranty providers, 55 allowed their warranty reserve balance to grow, while 43 allowed it to shrink, and two left it unchanged. If we assume that an increase in the reserve balance is "good," then we can state that only 24 of the 100 companies were on the "good" side of all three metrics: falling claims and accrual rates, combined with and rising reserve levels. Interestingly, only five of those 24 made any of the lists below: Applied Materials; Thor Industries; BorgWarner; Ciena; and Novellus. The others turned in increases or decreases that were not as big as those in the top 10. So let's start with a look at the ten biggest reductions in claims rates. And let's pick consumer audio electronics maker Harman International as an example, to show how these calculations work. In the second half of 2009, the company reported sales of $1.695 billion and warranty claims of $50.6 million. So its claims rate was 3.0% for the period ($50.6/$1695). In the second half of 2010, sales grew 6% to $1.793 billion, but claims fell to $26.5 million, for a claims rate of 1.5% ($26.5/$1793). So if we take the claims rate at the end of 2009 and the end of 2010 and compare them, we find that the rate fell exactly in half, from 3.0% to 1.5%. And that's a 50% reduction in rates -- a massive change for only a year. However, of the top 100 warranty providers, four did even better: Paccar; Xerox; BorgWarner; and Mohawk Industries. Paid Rate Paid Rate vs.
Notice that for Xerox, the amount of claims remained the same, at $41 million, but the rate fell. One would immediately suspect a massive sales gain, but in the case of Xerox, it was simply a change in the way it reports its product segments. This year, there are fewer and larger segments on their books than there were a year ago, so the amount of sales appears to have tripled. But it didn't really. It's just an accounting change, and that change is the same reason Xerox is also on the list in Figure 3 below. In Figure 2, we're looking at the ten biggest claims rate increases. And while some of the changes are very large, they aren't necessarily alarming. In fact, they're probably downright sensible. For instance, a year ago First Solar's claims rate was at a relatively low level at only 0.12% of revenue. Now it's at a more realistic level of one percent of revenue. But in terms of the annual change, it's more than an eight-fold increase -- the biggest one of all. Stanley Black & Decker, Oshkosh, and PulteGroup are on the top 10 list because of acquisitions and mergers, so there's nothing to worry about. But Harris, with its jump to an 11% claims rate in the second half of 2010, would be a big worry no matter what the number was a year ago. That it's so high and that it's so much higher than a year ago (which was high at 6%) should be worrisome to everyone. But alas, the company makes no mention of a possible reason in its financial statements. There are no major warranty providers with a higher claims rate than Harris. Lexmark International, whose business model tends to lean heavily on the sale of consumables (and therefore which tends to have relatively high warranty expense rates in percentage terms) has actually been bringing its claims rates down from the 10% level to under 8% in 2010. Nvidia, which had its well-publicized chip defects a year ago, managed to bring its claims back down to 6.4% by the fourth quarter of 2010. Even Standard Motor Products, whose aftermarket parts sales seem to always attract a lot of warranty claims, was at 6.3% for the full year. So Harris was the only large warranty provider with a claims rate above 10%. Accrual rates are a bit more discretionary. If claims rates are what happens to you, accrual rates are what you think will happen. If you think sales will soar and/or repairs will plummet, you reduce your accrual rate. And if you reduce your accrual rate more than 90 out of the 100 largest warranty providers, you make it onto the list in Figure 3. Made Rate Made Rate vs.
Microsoft is at the top of the list in Figure 3, primarily because the Xbox 360 crisis is now safely behind them. That product line was a billion-dollar crisis and public relations disaster for the company in 2007. But by 2010, the cost of Xbox 360 repairs and replacements had gone back to being a manageable cost of doing business. The company's accrual rate, which rose above six percent of the entertainment division's sales in 2007, was back down below one percent in 2010. Others are on the list for less clear reasons. In fact, for some it seems to have more to do with the need for cash than a reaction to increased product quality. But we don't want to do the work for the regulators and the auditors. We'll leave that job to them, to figure out which companies are "making their numbers" by shorting their accruals, and which are reacting to legitimate trends in failure rates, product reliability, and repair costs. At the other extreme, 33 of our top 100 warranty providers saw fit to increase their accrual rates in 2010, and the top 10 of those increases are listed in Figure 4. Stanley Black & Decker was the only one to more than double its accrual rate, but as we mentioned, that is easily explained by the merger it underwent last year. At Apple, the jump from 1.0% to 1.6% comes as no surprise given the headlines about iPhone and iPad product defects, but keep in mind that a 1.6% accrual rate is still on the low side for a high-tech hardware company. Motorola is on the list twice, because it actually is now split into two companies. We'd suggest that the two new halves of the company are just being prudent and cautious, and are likely not to repeat their appearances on this list a year from now. But time will tell. Of the others on the list above, the only one we'll mention is Itron, and only because its warranty cost increases, which inevitably reduced earnings by driving up the cost of goods sold, has now manifest itself into a class action lawsuit by disgruntled investors, which among other charges alleges that "the company lacked adequate internal and financial controls." We don't want to hand them any additional ammunition, except to say that yes, Itron's 30% increase from 2009 levels really was one of the biggest warranty cost increases of all. We should also mention that this is the first time Itron ever made a list of the top 100 warranty providers. And, while we're at it, we should also mention that Itron's sales grew 34%, and warranty claims grew by less, leading to a decrease in the claims rate. That's a very positive combination. But the plaintiffs probably won't mention those inconvenient facts. By the way, those making their first appearances in the top 100 list include Itron; Harris; Ciena Corp.; First Solar; and Gardner Denver Inc. Companies making their second-ever appearance in the top 100 include Bucyrus; ITT; Advanced Micro Devices; SanDisk; and Flowserve. For these ten companies, welcome to the big leagues. You're now among the biggest warranty providers in the U.S.
On the Warranty Week web site, at the top of the home page, is a list of the top 50 warranty providers of 2010, along with their accrual totals and accrual rates for both 2009 and 2010. Except for Motorola Mobility and Harris, all 50 are returnees from years past. At the opposite extreme, there are two kinds of departures from the top warranty provider lists of past years. Some of them are gone because of acquisitions or mergers. Others are gone because their warranty costs fell below the $24 million minimum threshold that was needed to make the list this year. Those that were part of acquisitions include Goodman Global (which was acquired by a private equity firm named Hellman & Friedman LLC); Sun Microsystems (acquired by Oracle Corp.); 3Com and Palm Inc. (acquired by HP); and Black & Decker (acquired by Stanley Works). Companies that are still in business but which slipped below the $24 million level include ArvinMeritor; Delphi; and Visteon. And then there are the warranty reserve balances. It's probably the least useful and the most misleading metric of the three that we're looking at this week. That's because an increase in the reserve balance isn't necessarily always a "good" thing. Sometimes it can be caused by an unnecessary mistake, in that there was already plenty in the fund to pay future claims, but nobody was monitoring the inflows and outflows. Conversely, sometimes a decrease can be a good thing, in that it's the result of a big boost in reliability and a big reduction in repair costs, and was allowed to happen because an astute finance department realized the funds weren't needed. So let's hope there are solid reasons behind all 20 of the increases and decreased in Figures 5 and 6. And if there are not solid reasons, let's hope there are no auditors or regulators reading this issue of Warranty Week. Overall, 55 of the top 100 allowed their warranty reserve fund balance to grow from December 2009 to December 2010. Only 43 allowed the balance to fall. And two companies held the balance exactly the same. The top 10 of the 55 that saw increases are listed in Figure 5. Of the 55 that allowed their warranty reserve balance to grow in the past year, only also 22 raised their accrual rates. Yet 38 saw their claims rates fall. And only 14 of those 38 also raised their accrual rates. In other words, the primary reason for the balance increases seemed to be an unexpected drop in claim expenses as opposed to a planned rise in accruals. Figure 6 contains the top 10 reserve balance decreases. All of them allowed their warranty reserves to shrink by 22% or more. But some of the largest warranty providers of all also allowed their warranty reserve balances to fall in 2010, albeit by smaller percentages. Among the decreases that didn't make this top 10 were General Motors Co. (-3.4%); Ford Motor Co. (-18%); Caterpillar Inc. (-1.3%); General Electric Co. (-8.8%); and Cummins Inc. (-0.9%). Of the very largest warranty providers, only Caterpillar and Apple made any lists at all. This suggests that perhaps the largest warranty providers are the most stable and the least volatile of all. At the other extreme, of the dozen companies with 2010 claims totals between $24 and $31 million -- in other words, the 12 smallest of the top 100 -- seven of them made at least one list and five of those seven made two lists. In other words, some of the smallest warranty providers under consideration turned out to be among the most volatile. Three companies made the theoretical maximum of three lists each: Harris Corp.; KB Home; and Stanley Black & Decker. As was mentioned, the latter company's appearances on so many lists can quickly be explained away as a by-product of the merger between Stanley Works and Black & Decker. But we think the other two have some explaining to do to their shareholders. Also, for both of those companies, claims rates went up, accrual rates went down, and warranty reserves also went down -- a worrisome trifecta combination. And then there were 17 companies that made two lists: Apple Inc.; BorgWarner Inc.; Boston Scientific Corp.; Bucyrus International; Ciena Corp.; D.R. Horton Inc.; Itron Inc.; Lam Research Corp.; Microsoft Corp.; Mohawk Industries Inc.; NACCO Industries Inc.; Novellus Systems Inc.; Oshkosh Corp.; Paccar Inc.; PulteGroup Inc.; Tyco International Ltd.; and Xerox Corp.
Of that group, five were on the "good" lists both times: BorgWarner; Ciena; Novellus; Paccar; and Xerox. D.R. Horton and PulteGroup were on the "bad" lists both times. The other 10 were mixed: one "good" and one "bad." And of those ten that were mixed, only NACCO and Oshkosh turned in seemingly contradictory movements for their claims and accrual rates (one goes up while the other goes down). The other eight saw a pairing of changes in their claims or accrual rates, and their warranty reserve balances. There were 17 companies that made only one list. And then there were 63 members of the top 100 warranty providers group that made none of these lists, proving, in a way, that the 37 that did make at least one list are the most volatile, the exceptions, and the outliers. They are the most unusual members of the group in terms of the magnitude of their annual change in warranty metrics. We can't compare two companies directly. But we can compare each company to itself, and then compare the changes to each other. What we're spotlighting here are the companies that did the most good or the most damage to their warranty metrics in the past year, compared to all the other large warranty providers. Why they changed by so much is their story to tell, or to conceal, as the case may be. 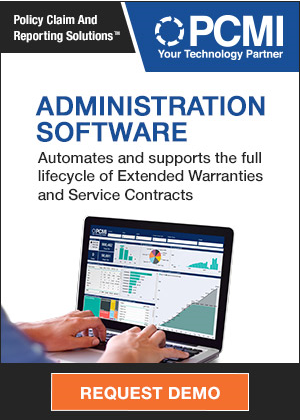 Readers needing more detailed snapshots of individual companies are invited to view the list of charts and spreadsheets available on the Warranty Statistics page. Utility Line Security files for Chapter 11 bankruptcy protection. Wisconsin officials say highway construction warranties save them time and money. Home warranties can help both sellers and buyers. Datalux Top Flight support program includes loaner computers during repairs. Canadian Solar to offer 25-year warranties in the fall. Atdec doubles warranty on wall and projector mounts to ten years. Home Warranty Inc. selects 4CS iWarranty Home Warranty solution. Mission Repair offers lifetime warranty on Apple iPad & MacBook repairs. Ford of Great Britain considers lengthening warranties beyond 3/36. Holden dealer admits to running misleading lifetime mechanical warranty promo. Pittsburgh Water's line warranty program ruled illegal. 4CS to provide Service Lifecycle solution to ZF Services North America. Pegasystems and Infosys to co-present at Warranty Chain Management Conference. South Africa's new Consumer Protection Act explained. SquareTrade announces extended warranty with guaranteed buyback for iPad 2. An in-depth look at the world market for battery-powered cars. US Fidelis assets to be sold to highest bidder at local auction. Lexus and Mini dealers score best in J.D. Power Customer Service Index. Jumbo Electronics offers extended warranty services in Qatar. TheAutoMoto Corp. upgrades its warranty to two years. IDC Manufacturing Insights to unveil warranty maturity model at WCM Conference. Right to Repair Act introduced into the Oregon state legislature. Best Buy to sell flat-rate Geek Squad Tech Support computer service plans. Consumer Direct Warranty Services gets another bad rating. American Home Shield announces winners of its 2010 Contractor Quality Bonus program. Bankruptcy court approves sale of Palm Harbor Homes to Cavco Industries. Debate continues over Uganda's ban against used computer imports. Micro Fire Apparatus becomes authorized dealer for American LaFrance. Warranty card from Nike baseball bat links suspect to double murder. Honda finds pattern in Civic hybrid warranty data, issues recall. Chrysler promises new attitude to suppliers regarding parts prices. Currys "Whatever Happens" warranty replaces camera damaged in a bike accident. Eighth incident logged of a Tata Nano catching fire in India. Dell to offer Next Business Day warranty services in Viet Nam. Furniture retailers promote their own versions of a lifetime guarantee. Chrysler recalls vehicles after finding pattern of engines stalling. Barclays analyst sticks with Ford $20 per share price target. Contractor tests four tractor brands for reliability, fuel cost & comfort. Warranty war? Michelin kicks off tougher guarantee for new tires. California says new ownership doesn't release contractor from past warranties. Edelbrock adds premium warranty program for E-Force superchargers. Carver/Marquis Yachts appoints Explorer Marine Services as a warranty service center. Mazda recalls 65,000 cars for spider problem. Ryan & Maniskas announces class action lawsuit against Itron Inc.
Law offices of Howard G. Smith announces class action lawsuit against Itron Inc.
GM Korea offers 5-year/100,000-km warranty for Chevrolet cars. Report published on extended warranties for new and used cars in Europe. Consumer Reports admits to gaps in recent Chrysler data in latest survey. ATV dealer accused of pocketing extended warranty premiums cops a plea. Sanuvox Technologies lengthens air treatment warranties from 5 to 15 years. How to take advantage of free extended warranties on credit card purchases. Egg Money credit card holders worry about losing free extended warranties. General Motors offers 8-year warranty for Opel Ampera. Michelin Promise Plan lets tire company show confidence in its products. ARCA Warranty Ltd. underwrites roofing warranties for roofers in Calgary. Consumer Reports finds some used cars have fewer problems than new models. NHTSA closes Jeep Wrangler fuel spillage probe but Chrysler lengthens its warranty. Kenworth & Paccar offer extra year of warranty to finance customers. Vehicle service contracts fall to 10th on Missouri AG complaint list. Amerlux announces 10-year warranty for its LED lighting fixtures. Ministry of Transportation Ontario likes its 7-year pavement warranty program. Assurant Solutions wins Stevie Award for innovation in customer service. SquareTrade wins 2011 Stevie Award for sales and customer service. Mercedes-Benz increases coverage of its Certified Pre-Owned extended warranty. Hyundais don't break much anymore, so no need to trim warranty to cut cost. LG Electronics USA launches new LG Service Advantage Program. Bernstein Liebhard announces filing of a class action against Itron. Credexx barred from selling vehicle service contracts in Washington state.